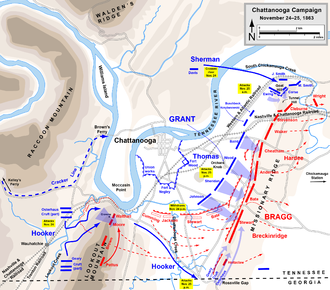 The Chattanooga Campaign  was a series of maneuvers and battles in October and November 1863, during the American Civil War. Following the defeat of Maj. Gen. William S. Rosecrans' Union Army of the Cumberland at the Battle of Chickamauga in September, the Confederate Army of Tennessee under Gen. Braxton Bragg besieged Rosecrans and his men by occupying key high terrain around Chattanooga, Tennessee. Maj. Gen. Ulysses S. Grant was given command of Union forces in the West, now consolidated under the Division of the Mississippi. Significant reinforcements also began to arrive with him in Chattanooga from Mississippi and the Eastern Theater. 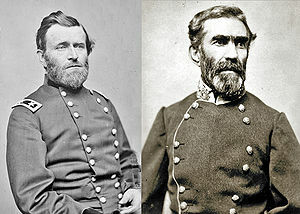 On October 19, Grant removed Rosecrans from command of the Army of the Cumberland and replaced him with Major General George Henry Thomas. ^ Chisholm, Hugh, ed. (1911). "Chattanooga" . Encyclopædia Britannica. 6 (11th ed.). Cambridge University Press. pp. 7–9. ^ The National Park Service's Civil War Sites Advisory Commission Archived November 6, 2013, at the Wayback Machine classifies two campaigns for this period: Reopening the Tennessee River ( Battle of Wauhatchie) and Chattanooga-Ringgold (the Third Battle of Chattanooga, frequently known as the Battles for Chattanooga, and the Battle of Ringgold Gap). Kennedy, Frances H., ed. The Civil War Battlefield Guide[ permanent dead link]. 2nd ed. Boston: Houghton Mifflin Co., 1998. ISBN 0-395-74012-6.